Our rawhide is 3/8" wide and very thick. It is cut from tough steer hide especially for chair seats. We try to send a continuous strand for each chair lot (30') but if a splice is necessary we will include directions for a simple traditional splice. 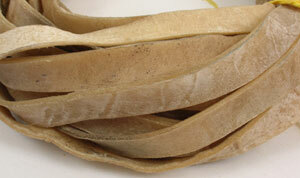 Soak the rawhide for 6 hours in warm water and it will stretch sufficiently to weave a mule eared chair seat.